for years I am trying to find out about the life of my grandfather, Wilfried (sometimes Will, Willi) FRANK. Since he has left our family in 1951, I am trying to get as many Information that I can. 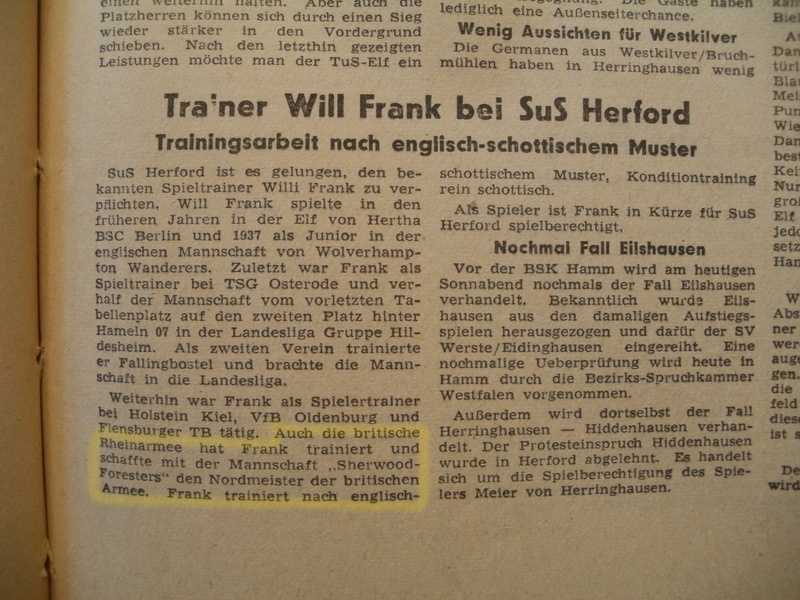 From an article in the public newspaper of Herford from 1950, I learned that he had trained the BAOR Team "Sherwood Foresters" in Football, to win the "Nordmeister" Championship, in his earlier vita. I wonder in which year and where this has been. Are there any records? Whom can I ask to help me, finding out more? Any help is appreciated, thank you very much. Places Served : Carlisle AAS, Aden, Hildesheim, Bordon, Fallingbostel, Dover, NI Tours, Osnabruck, Herford, Muenster, UN Nicosia, SBA Dhekellia Cyprus x2, Waterbeach, Civi Street 1988. Retired from VOSA 2007. I hope somone might be able to help you. Can you send a copy of the newspaper please. Was your grandfather a German civillian or a British soldier? It is possible you may have a problem placing the newspaper copy/photo here for 2 weeks, because you are a new member. I have sent you a pm with my email address. If you send me by email any newspaper photocopies, I will place them on here for you. Thank you all so much for your help - we are working on this riddle for more than 5 years already. This is from the Herford public newspaper from Jan 21, 1950. I have received your pm. Good that you have found a method of posting the newspaper report. There might be a chance that an ex soldier will remember the Sherwood Foresters and the football training. » Season of change; need clarity and clear direction.